Personas are fictional characters that describe an organization’s customer behaviors, emotions, attributes, motivations, and goals. They are an important tool to share customer insights and understanding across an organization. Personas also serve as a check to make sure your organization’s actions meet the needs of the majority of customers, including visitors to your website, contact center, in-person visits, and interactive voice response (IVR) self service customers. 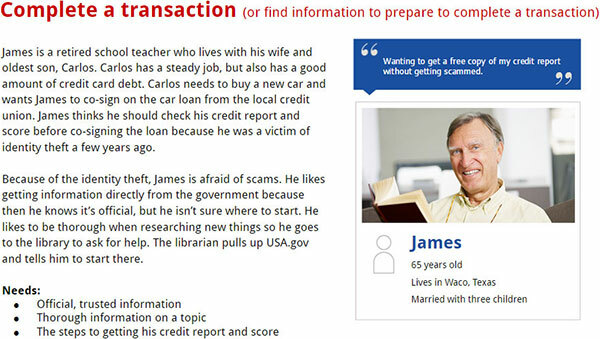 Personas aren’t new to USA.gov. We developed personas several years ago because we recognized the importance of understanding our customers, their behaviors and information needs. 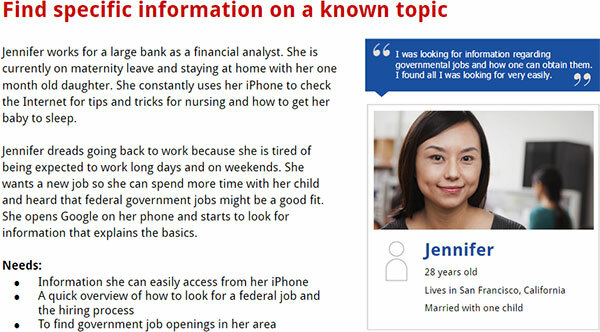 As we’re evolving USA.gov and our contact center platforms, updated personas are important. These categories aren’t perfect – there is overlap between the customer types. A customer may fall into multiple types, but we still think these personas are useful for thinking about how our customers look for information. Many customers come to us to complete a transaction, such as renewing a passport or to change their address. Many government transactions involve downloading forms or finding copies of a vital document, such as a birth certificate. Due to the preparation involved in completing some transactions, we know customers come to us for help with this step. These customers know what they want but need help finding it. They might want to know how to get a free copy of their credit report or how to apply for Social Security benefits. We occasionally get inquiries that are very specific, such as the number of people on welfare in Kansas in 2011. We know from survey comments that many customers want to browse information on a topic. They want to see all available health insurance options, for example. More frequently, they may have an idea in mind about what information they want, but they do not know exactly what that information is. 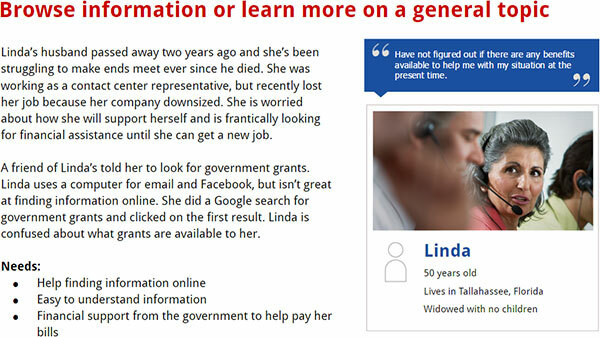 A popular example is financial assistance available from the government. Many customers want to know what assistance is available to them, but can’t articulate if they want a grant, loan, etc. This also falls under finding specific information on a known topic, but the A-Z directory of federal agencies is so popular, it’s worth making a separate category. 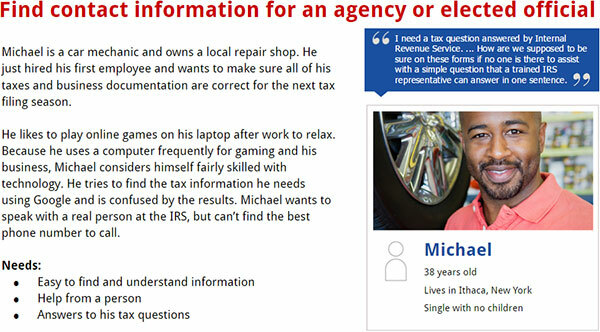 Customers are looking for contact information, especially hard to find information, such as the phone number for the IRS. We drafted our personas in about two weeks and kept our process simple. We involved key stakeholders, such as managers, from the beginning. We also used data from multiple sources to inform our personas. To create personas for each type of customer, we picked some of the most common tasks people come to us to accomplish. We even had a little fun with data. After choosing an age in the most popular age range, we used the Social Security Administration’s baby name data to pick the most popular name for that year. While the personas are composite representations, the quotes associated with them are from real customers. Because of time and resource constraints, we used customer satisfaction survey comments as the main source of qualitative data. We’re sharing the personas across our organization and creating journey maps based on these personas and the common questions/scenarios they experience. The personas may evolve as we journey map, and we plan to revisit them annually to make sure we’re in step with customer motivations, emotions, goals, needs and behaviors. In the future, we plan to conduct first-person research with current and potential customers of USA.gov to inform our customer understanding and their associated journeys. We will continue our persona development process to include USAGov en Español (formerly known as GobiernoUSA.gov) and future customers. This will ensure that we understand and meet ever changing needs. The complete list of our four personas is available [PDF]. In a future post, we will share examples of the customer journey maps associated with our personas. « The Content Corner: Should You Be Podcasting?